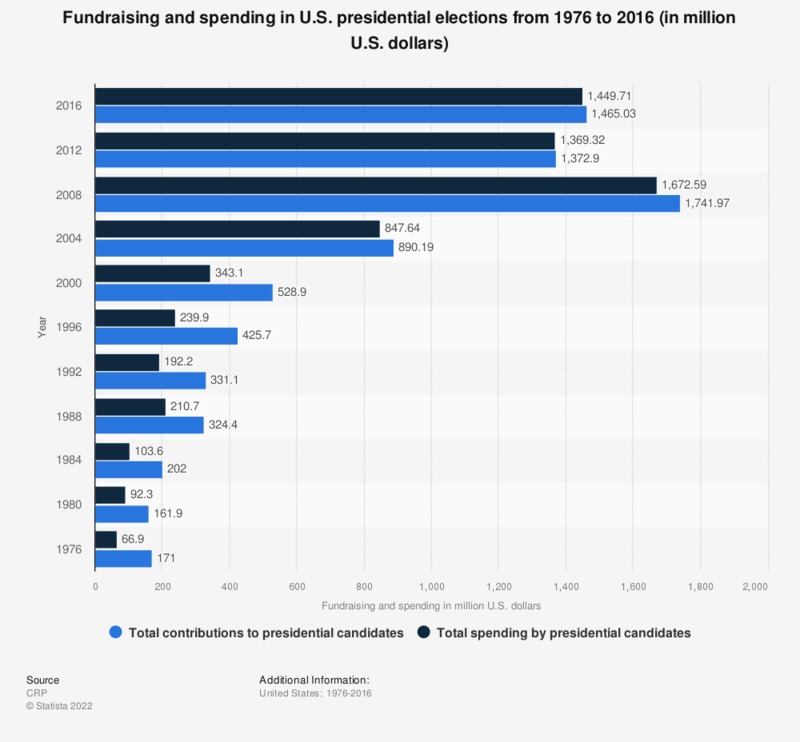 This graph shows total fundraising and spending in United States presidential elections from 1976 to 2016. About 1.7 billion U.S. dollars were spent in the 2008 election, when Barack Obama became president. In the 2012 election, contributions to presidential candidates, totaled to about 1.372 billion U.S. dollars. Total spending was at around 1.369 billion U.S. dollars. Money used by super PACs is not included in this statistic. Fundraising plays a central role in presidential election campaigns in the United States. Barack Obama’s reelection campaign in 2012 was also heavily financed by independent donators. One of the top contributors to Barack Obama’s election campaign was the University of California, with donations of about 1.2 million U.S. dollars. According to the Federal Election Commission, the organization themselves did not donate money to Barack Obama, the money came from the organizations' PACs, their individual members or employees or owners. Obama was also the supported by industries and companies, such as the Google Inc which donated around 800,000 U.S. dollars and Time Warner with about 440,000 U.S. dollars. In November 6, 2012, Barack Obama was reelected as President of the United States. He won among women, non-white voters and young voters. Data from the National Election Pool shows that Obama also won the election in big and mid-sized cities. His opponent Mitt Romney, who was the nominee of the Republican Party, won among the voters who had an annual income of 50,000 or more U.S. dollars. According to exit polls, more college graduates voted for Mitt Romney than for Barack Obama. The data are not adjusted for inflation.